World Boxing Organization (WBO) Welterweight World champion Manny “Pacman’ Pacquiao (59-6-2, 38 KOs) and his Hall-of-Fame trainer, Freddie Roach, held a media workout today in Australia, preparing for this Saturday night’s showdown between Pacquiao and his title challenger, Jeff Horn (16-0-1, 11 KOs). “Battle of Brisbane: Pacquiao vs. Horn,” presented by Top Rank and Duco Events. will air this Saturday evening, exclusively in Canada on Super Channel, live from Suncorp Stadium in Brisbane, Australia. Super Channel subscribers will be able to watch four exciting fights, starting at 9 p.m. 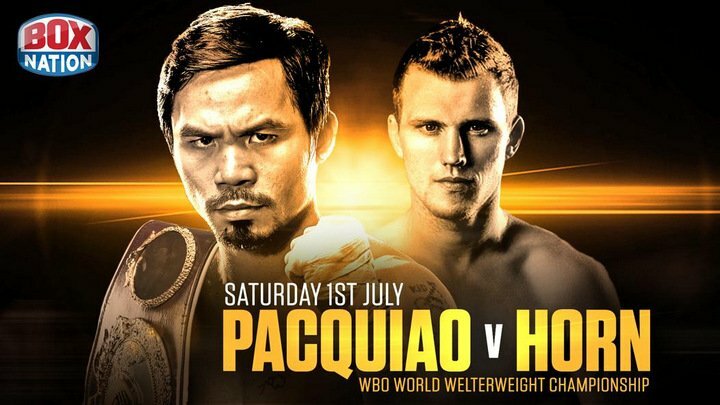 ET / 6 p.m. PT, on the “Battle of Brisbane” card, headlined by Pacquiao vs. Horn. These fights will also be available on Super Channel On Demand. Saturday night’s Super Channel telecast will also feature two-time Irish Olympian Michael Conlan (2-0, 2 KOs), from Belfast, in a six-round featherweight bout against Jarrett “Juarez” Owen (5-4-3, 2 KOs), of Brisbane.In the 12-round co-feature,International Boxing Federation (IBF) junior bantamweight world champion Jerwin “Pretty Boy” Ancajas (24-1-1, 16 KOs), of Cavite City, Philippines, will defend his title against top-rated contender Teiru Kinoshita (25-1-1, 8 KOs), of Kobe, Japan. The live telecast will open with an eight-round middleweight bout between Shane Mosley, Jr. (10-1, 7 KOs), of Pomona, Calif. and son of former three-division world champion “Sugar” Shane Mosley, and David Toussaint (10-0, 8 KOs), of Canberra, Australia.